All eyes will be on the battle between world No 1 Novak Djokovic and Roger Federer, as we head to The O2 in London for the ATP Finals. The top eight singles players in the world qualify for the prestigious season-ending championships at the greatest of venues this November. Reigning Wimbledon and US Open champion Novak Djokovic will be aiming to win a record-equalling sixth title, while Roger Federer heads to The O2 having claimed the Australian Open and will be seeking to land a record-extending seventh ATP Finals crown and his first since 2011. Bulgaria's Dimitrov became the first man for 19 years to win the ATP Finals on his debut appearance with victory over Belgian star Goffin. 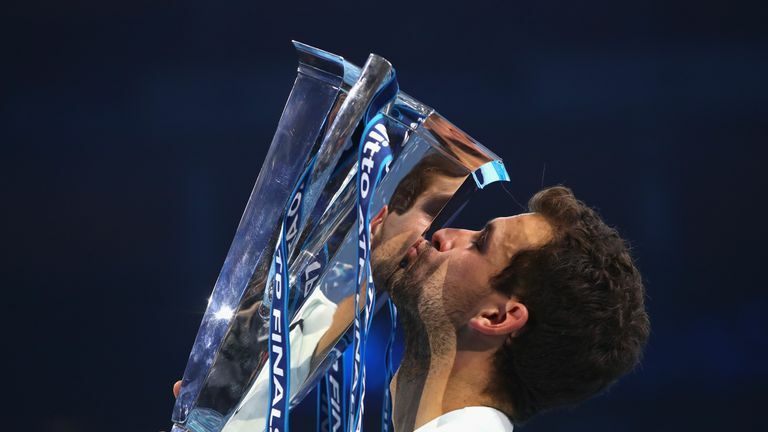 Dimitrov had already crushed Goffin for the loss of just two games only four days earlier in the group stage, and he came through the tournament unbeaten in five matches to claim the biggest title of his career. Murray edged Kei Nishikori in three hours and 20 minutes to reach the semi-finals, before taking three hours and 38 minutes to defeat Milos Raonic in another lung-busting marathon match. In a straight shootout for world No 1 with Djokovic, Murray ended a sensational 2016 by recording his 78th victory from 87 matches with a straight-sets win over his old foe. Djokovic became a five-time champion when he successfully defended his title in his 15th final from 16 tournaments in a remarkable year. Federer had ended Djokovic's streak of 38 consecutive indoor match wins, 23 overall this season and 15 straight at the ATP Finals earlier that week, but the world No 1 cleverly adjusted his tactics to gain revenge in the final. The 33-year-old Swiss announced he was "not match-fit" before the final after sustaining a back injury, meaning Djokovic collected the trophy once again. Federer apologised in person to the crowd, saying: "I'm sorry I'm not fit to play. I hope you understand. I wanted to come out personally and explain. I did everything I could. I took pain-killers, had rest until the very end, but I just cannot compete at this level with Novak. At my age it would've been a risk." Djokovic completed a successful defence of his title with revenge over his nemesis Nadal. His most recent defeat came against Nadal in the US Open final, but there was little prospect of a repeat during a one-sided contest. The Serb clinched his third win at the season-ending event to go with his triumph a year earlier and 2008 success in Shanghai. Victory was also his 22nd in a row and gave him a fourth straight tournament success to end the season having also won in Beijing, Shanghai and Paris over a six-week period. Federer was back in the final and attempting to become the first player since Ivan Lendl to win three season-ending championship titles in a row. On his 11th appearance at the event, Federer suffered a surprise defeat to Juan Martin del Potro in the group stage, but still made it through to another final with victory over Andy Murray. Top-seed Djokovic was showing imperious form sailing through to the showpiece without as much as breaking a sweat. The Australian Open champion showed great resilience to fight back and capture his sixth title of the season. Federer became the most successful player at the season-ending championship, marking the 100th final of his career with his 70th title over the big-hitting Frenchman. He showed his hunger for success had not diminished as he successfully defended his crown, winning an unprecedented sixth title. The master of court manipulation upped the tempo to run away with the match by the banks of the Thames and join Lendl on an unmatched-39 match wins at the tournament. This match was billed as the Ali versus Frazier of the tennis world. Federer opened his year by winning his 16th Grand Slam title at the Australian Open and was ready for a rumble with the world No 1 from Spain, who was the bookies' favourite having collected his fifth French Open title, his second Wimbledon crown and then completing his set of career slams at the US Open. It was the first time for 24 years the top two players on the Tour had contested the title match and the excitement in Greenwich was palpable with footballing legend Diego Maradona and Ronnie Wood of the Rolling Stones in attendance. Federer came into the match having lost six of his past seven matches to the Spaniard, but in the duos first meeting in London since their legendary Wimbledon final in 2008, the mighty Swiss prevailed. Few people backed Davydenko to take the title in the very first year the ATP Finals were held at London's O2 Arena. But just 12 months after the Russian suffered defeat to Djokovic in the Masters Cup final in Shanghai, he was back in the main event and playing the best tennis of his life. The 28-year-old from Volgograd lost a tight group-stage match to defending champion Djokovic, but then beat Australian Open champion Nadal and Robin Soderling, before seeing off the winner of that year's French Open and Wimbledon titles Federer [for the first time in 13 attempts] in the semi-finals. He overcame the giant 6ft 6in US Open champion Del Potro to win the most lucrative title of his career. Check our game-by-game coverage from all Group matches, semi-finals and final at the ATP Finals in London on skysports.com/tennis. We will have coverage of every match live on Sky Sports. See TV listings HERE.